Preparing for a job interview is crucial since it is essentially a time where you’re selling yourself as a qualified professional for the position you applied for. While you’re plugging away compiling the best answers to potential interview questions, it’s good to have some questions at hand to ask your hiring manager about themselves, the company culture and how your performance will be tracked if you were hired for the position. How can I best prepare for a job interview? Skillstalk understands the pressure you feel when preparing for an interview. Coming to a job interview unprepared could potentially hinder your performance, so the act of “winging it” may not work as well as you anticipated. How to overcome your fear of face-to-face interviews: If nerves are getting the best of you, this article addresses the best tips to help overcome your fear of face-to-face interviews. Simple things like acting confident and researching ahead of time can help reduce your nerves. How to dress for a job interview: First impressions count, more than you think, so dressing for the part can help you feel confident in your skin and look more professional to potential employers. Skillstalk go over the guidelines on what kind of outfit you should wear and the kind that you should avoid for a job interview. 8 common interview questions and how to answer them: Of course, you cannot predict what type of interview questions your potential employer will ask you, but there’s no doubt that there will be some common interview questions you can prepare for. Using these questions can act as a scaffold when it comes to your answers, helping you adapt these to similar questions asked by the hiring manager. Why is it important to ask questions when being interviewed for a position? While you may be excited for this position and have every intention of saying the right things during the job interview, asking questions to the people interviewing you is just as important. No matter how detailed the job ad and professional-looking a company’s website is, asking questions about the role and culture will give you a general idea on what it’s like working there. You will get more information beyond what their website has detailed since the hiring managers can tell you about their experience, any advancement opportunities and summarise everything you need to know to help you make a decision on whether you want to work for the company or not. Skillstalk have compiled some of the best questions you can ask during your interview that could help you stand out from other candidates, while also receiving the best answers from the hiring managers themselves and the company. If you want to know more about the role you applied for, asking questions about it may help you, especially if the responsibilities written in the job ad are unclear. Asking about the role will give you more scope on what is expected from you and how your performance will be measured. This is a great opportunity for you to ask what their procedures are when it comes to employee reviews and how feedback is given. What do the day-to-day responsibilities of the role look like? What does success look like in this position, and how do you measure it? What do you see as the most challenging aspect of the job? Company culture is important, especially for millennials. A good rule of thumb is to take up a position where the values of the company are similar to yours. Asking about company culture not only gives you a general idea on the people you’ll be working with, but you will also get to know what type of projects they have worked on, their proudest achievements and what expectations they have of everyone. It also gives hiring managers an opportunity to essentially sell the company by sharing the employee benefits and company perks too. What’s your favourite part of working at the company? How has the company changed over the last few years? If career progression is important to you, it is in your best interest to know more about advancement opportunities and potential to move around the company incase you feel stagnant in a position. Having room to be across multiple roles can be attractive depending on what you want to do professionally. In this way, you can gain transferable skills for other roles in the future, or even be in the lucky position where you’re able to convince your future employer to pursue further training opportunities, such as studying a course that aligns with your professional goals. Generally speaking, the people who are interviewing you for the position are likely to be the people you’ll be working with directly. Depending on their recruitment process, you could be in the same room as the HR Manager and the hiring manager. Being able to ask them questions about their own career experiences and how their roles have evolved will give you a good idea on what type of people you’ll be working with and see what their management style is like. How they speak about their positions will say a lot about their leadership, goals and their hopes on how you can help them make their jobs easier if you were hired for the position. Why did you come to this company? Has your role changed since you’ve been here? If things go well during the interview process and you end up with a job offer, you’d obviously want to see how you’re tracking when you’re in the position. While starting a new job can make you feel like you’re starting school again, it’s important you receive feedback when it’s necessary. No one likes a micromanager and you’ll know how to spot one as soon as you start a new position. A good manager will not control the way you work and ideally will give you the tools you need to ease into the position. They will also not need to oversee your work all the time and trust that you understand what’s expected of you. Good managers also give you further guidance when mistakes happen or be available when it comes to answering your questions and concerns. What are the most important things you’d like to see someone accomplish in the first 30, 60, and 90 days on the job? If you know that your interview went well, it’s not a bad idea to ask questions about next steps. Asking questions for next steps will also give you a great indication if the hiring manager is considering you as an ideal candidate for the job. There may be another interview scheduled with an executive manager of the company, or they may need samples of your work, especially if you’re going after a job where writing is involved. In addition, questions about next steps can give you the opportunity to clarify anything that was not mentioned by you during the interview. Is there anything that concerns you about my background being a fit for this role? Want to improve your chances in getting a job interview? While writing a good cover letter and resume increases the likelihood of scoring a job interview, you may entice potential employers even more if you have some qualifications under your belt too. 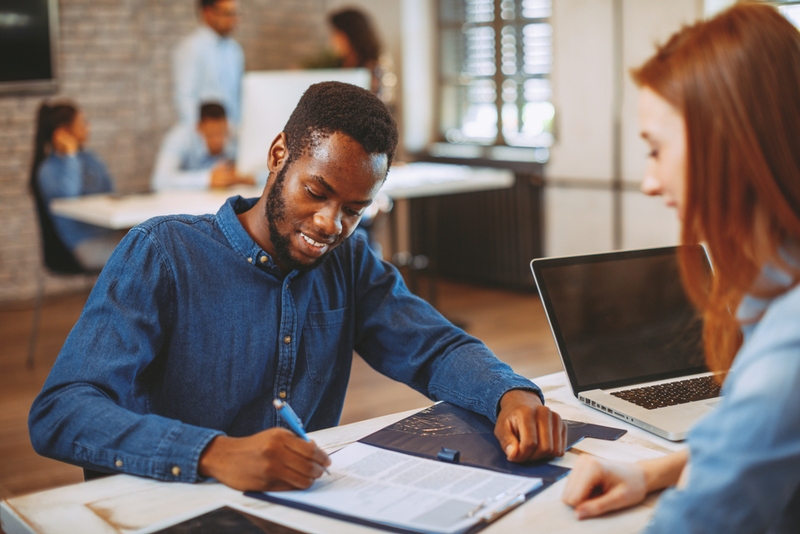 Not only does further study help your resume stand out to employers, but it shows that you’re self-motivated and value professional development and learning. Upskilled offers many courses across multiple industries, which can help you get a head-start in your career. Courses are flexible, self-paced and can be done completely online (with some that require work placement), helping those juggle full-time work and other personal commitments. See what our students have to say about their experience and begin your course search today!